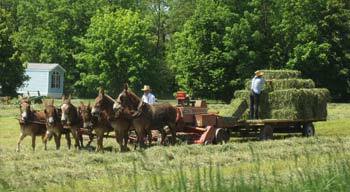 Amish people really know how to do manual labor and hardly look tired when performing their chores. This seems amazing to most from the outside world. Many claim it is in their genetic makeup, but in reality it is because these people are used to it. Even the women fill their spare time with Hand quilting beautiful Amish Quilts. The performance of manual labor is how all things are accomplished in this closed religious society. These chores begin before sunrise with the feeding and taking care of the livestock they raise. It encompasses their laundry, since they do not posses any electric cloth dryers, choosing to use a clothes line and the sun. This takes time, but the scent their cloths have is fresh and not artificial. In this society it is also frowned upon to smoke, they do not take drugs of any kind and abstain from drinking beverages that contain alcohol. Because of this their bodies are cleaner than what most other Americans have. This makes it possible for them to toil in the fields and around the homes for hours without taking a break or becoming tired. The longevity of their seemingly endless supply of energy is the result of their way of life. Just like a professional athlete must exercise so they can last longer than their opponents. The Amish do manual labor from an early age up until they can no longer walk. Their bodies are just used to it. This is a lifelong conditioning of their muscles. In the Amish beliefs they think that idle hands can let the devil in. Because of this they try to stay as busy as possible. A good example of this is the Amish Quilting Bee and the socializing of the ladies in this community. They do gather together to talk about the events and relationships of those in their communities. This gathering is not just sitting around drinking coffee or tea while eating snacks. Instead they make use of their idle hands by creating one of kind handquilted Amish Quilts. This keeps their hands and minds busy while they are enjoying a good conversation about the things in life that matters to them. It also servers another purpose in which the quilts will be used to keep them warm in the long cold winter months. Some of these high quality Amish quilts are also sold to outsiders so a revenue stream can be made to help pay the taxes the US government demands from all Americans. It is because of this constant movement the people do in this closed society, they are in great shape. It is a rare thing to see a fat or overweight Amish member. Because of its rarity or non-existence, the number of diabetics in this section of the America society is also almost non-existent. Yes the Amish as a group are the best in shape and most willing to perform manual labor for endless hours than any other group in the world.